The end of the school year is quickly approaching. Soon it will be time for water balloon fights, camping, trips to the swimming pool, and fun summer kids crafts. Summer is busy. 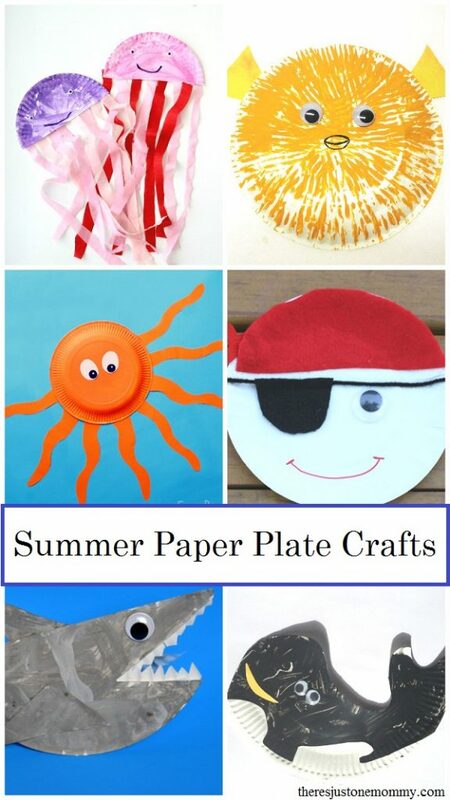 These summer paper plate crafts are a simple way to squeeze in craft time. This Watermelon Craft from Coffee Cups and Crayons will have you ready to cut into the classic summer treat. I love these Paper Plate Dream Catchers from Red Ted Art. They’d be perfect as a summer craft for older kids. You won’t be able to resist this Octopus from Easy Peasy and Fun. So cute! 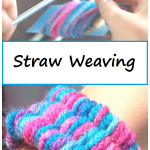 This Woven Ocean Animals craft from JDaniel4’s Mom is great for sneaking in a bit of fine motor work. 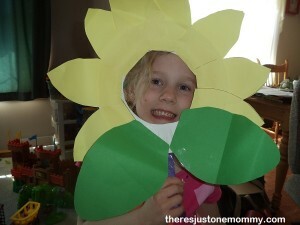 Preschoolers can become smiling flowers with this Paper Plate Sunflower from There’s Just One Mommy. Get the camera ready! Ahoy! Get ready to hunt for buried treasure with this fun Paper Plate Pirate from Chirping Moms. Bring the sunny days inside with this Sunshine from Sunshine Whispers. 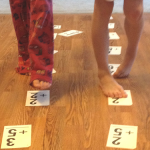 Toddlers and preschoolers will have fun with this Ladybug Craft from No Time for Flashcards. These Paper Plate Jellyfish from ABC Creative Learning are so fun. Paper Plate Seashells from Artsy Craftsy Mom are such a unique summer craft for kids. This Under the Sea Craft from The Imagination Tree brings the magic of the ocean to your home. Don’t get pinched! This Crab from ABC Creative Learning is super cute. Kids love rainbows. This Rainbow Craft from Arty Crafty Kids is sure to make them smile. You can make your own colorful Paper Plate Rainbow Fish, just like the ones in the book, from A Little Pinch of Perfect. 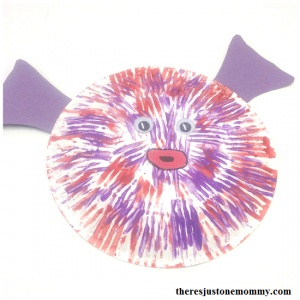 These Paper Plate Puffer Fish from There’s Just One Mommy is colorful and fun to make. Preschoolers will love this Rocking Boat Craft from JDaniel4’s Mom. Make your very own Sea Turtle from There’s Just One Mommy. This Hot Air Balloon from ABCs to ACTs is perfect for taking tiny toy figures for trips. Simple is best. 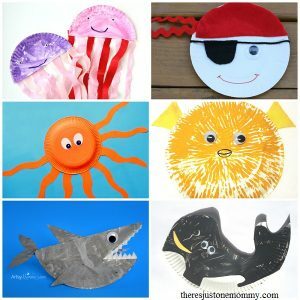 This Fish Craft from Kids Activities Blog would be cute hanging on a door. I just love this Paper Plate Whale from In the Playroom. This Orca Paper Plate Craft from Crafts on the Sea would be the perfect complement to a mini ocean animals study. The feathers make this Feathery Paper Plate Flower from There’s Just One Mommy super fun. This Rocking Paper Plate Shark from Artsy Momma would be perfect to make for Shark Week. 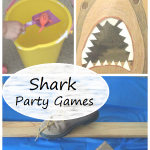 Then you can have fun playing a few DIY Shark Party Games and snuggle up and read a few good shark books. Kids will love making this Paper Plate Shark Mask from JDaniel4’s Mom. Get ready to make memories this summer with outdoor water activities and a few fun summer paper plate crafts. These look like so much fun! I’m pinning this one for later. love paper plate crafts! pinned to our paper plate board! Those are so cute! I love the pirate. Thanks for this collection. 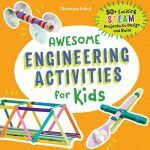 I was looking for crafts for the kids for the vacations. These are just perfect. I hope you have a wonderful vacation time with the kids. So many cute ideas! I’ll havevto try some of these with my grandkids! !